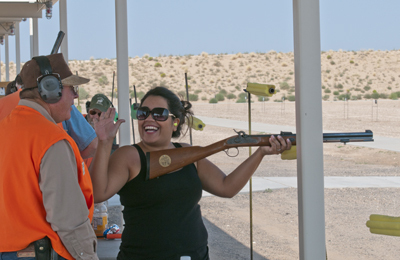 ALBUQUERQUE – The New Mexico Department of Game and Fish and 3,682 of its closest friends got together at the Department’s Outdoor Expo last weekend at the Albuquerque Shooting Range Park. It was a record crowd for the 10th annual event. The Expo started Friday, Aug. 17, with 39 students from Albuquerque Public Schools being taken on a tour of the venues. The tour was part of a National Guard outreach program. The Expo venues included firing shotguns, .22-caliber pistols, .22-caliber rifles, muzzleloaders, archery, casting, and fishing for catfish. This event also introduced participants to the outdoor skills of kayaking, rock climbing and use of the atlatl -- a hunting tool used in New Mexico during prehistoric times. The Department stressed conservation messages throughout the event, illustrating how money generated by hunting, fishing and trapping license fees was used to re-establish elk, Rocky Mountain bighorn sheep, bears, cougars and other wildlife in the state. Many populations were depleted before New Mexico became a state in 1912. Ninety-seven volunteers and 54 Department staff members worked to make the event a success. The Albuquerque Fire Department and the Community Emergency Response Team were available to assist with public or staff emergencies, although there were no injuries or accidents.